My name is Jutta Mason and I’m part of a small charitable organization called the Centre for Local Research into Public Space, or CELOS. We started this group in 2001, prompted by our work at Dufferin Grove Park. In 2003, outdoor-rink friends and some young, enthusiastic part-time Ward 18 rink staff started a website called cityrinks.ca, funded through CELOS, about all the outdoor rinks citywide. 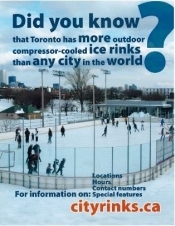 Toronto has more compressor-cooled outdoor rinks than any other city in the world: 51 run by the city, with more coming. But this is a fact that’s not widely known. Even some city councillors are not aware of the extent of our city’s civic winter resource. How much these rinks cost to run is a bit of a puzzle – the city’s own estimates go as high as $13 million a season, in this 2007 "Full Costing" study. But last year the Globe reported the cost as $6 million a season. If we go with the $6 million figure, that’s enough money to turn many more of our outdoor rinks into hospitable, lively winter gathering places. Neighbours can have places to engage with each other and visitors to Toronto can play all the shinny hockey they ever dreamed of – the speed and excitement of pond hockey without the thrashing they see on TV. Cityrinks.ca has been documenting how our outdoor rinks run for 13 years now. 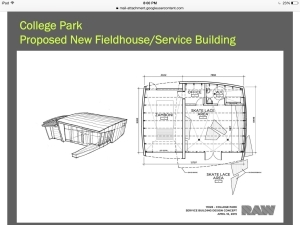 Nine years ago CELOS presented a rink report to the Parks and Environment Committee. The committee referred it to the General Manager of Parks, Forestry and Recreation, and it was never heard of again -- too bad. Our report this time has many of the same suggestions as last time – simple remedies to the challenges that lead to times of low attendance, inconsistent public access, unreliable ice-conditions information, unworkable rink season timing, and underuse of staff talents. Our report recommends having more locations with skate lending, real food, sociable, comfortable rink houses welcoming to all ages, hospitable staff who are good at problem-solving, sensible timing of the rink season, and reliable ice-conditions information. We give examples of how these elements could work at rinks where they are currently missing. 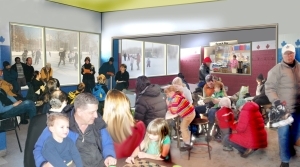 What if the empty market building beside Mel Lastman Rink had skate lending? 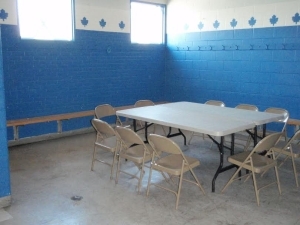 What if Scarborough Civic Rink improved its recently renovated change room with skate lending, and food for hungry skaters? 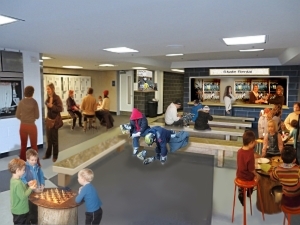 What if the planned new College Park Rink had skate lending added, so that nearby hotel guests, and newcomers, could skate and meet people there? What if a neighbourhood rink like Giovanni Caboto at St.Clair and Lansdowne knocked out a wall and enlarged some windows? 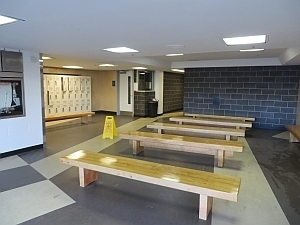 These kinds of simple changes to existing rink buildings are not expensive, but they’ll only work if thoughtful, experienced front-line rink program staff are allowed to put their heads together with rink users in each neighbourhood – not at a token meeting, but daily – to try out what works best locally. Our mayor has recently been promoting park conservancies as the way of the future. Another often-mentioned thing is “partnerships.” But how can we make those ideas work without day-to-day cooperation – rink users being real partners with our municipal staff? That kind of co-operation is how the three ward 18 rinks got so popular. But four years ago the Ward 18 outdoor rink staff were told that working on ideas and programs directly with skaters put them in a “conflict of interest” situation. They were ordered to get back inside the strict municipal hierarchy and take not the smallest action without prior approval from their off-site supervisor. Management costs went up, while the programs began to falter. The evidence is in the rink report. We think it’s time to stop dismantling what works well and take another run at making more of the rinks work better. 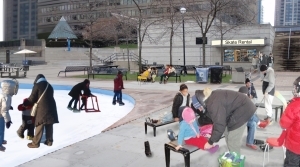 Toronto should take its place as the welcoming outdoor skating capital of the world. But as far as I can see, at the moment there’s nowhere for this report to attach to decision-makers. Can your committee help? Mel Lastman Rink next year? Scarborough Civic Rink Jan.12 2018?